Jim Cobb Nov 20, 2018. 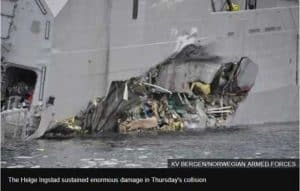 While the country of Norway dodged a bullet on the 8th of November when the KNM Helge Ingstad, one of five of that nation’s naval frigates, collided with Malta registered oil tanker Sola TS, the spill could have been far more catastrophic for the country. The two vessels collided at 4 am local time outside of the Sture Terminal on the western side of Norway as the tanker was departing for Britain with a full load of crude oil and the frigate was inbound from the Trident Juncture NATO military drill. Investigators are still unsure why the two vessels, who were in contact with each other prior to collision did not avoid each other. 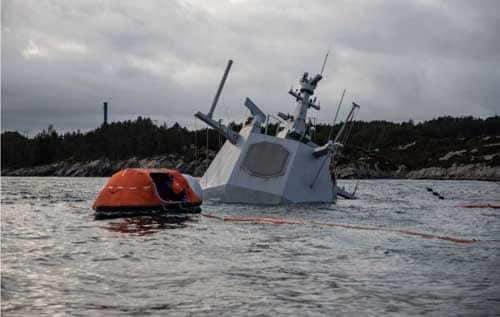 While the naval vessel suffered severe hull damage in the collision that injured eight of the 137 aboard the frigate, environmental damage was initially minimized by the actions of tugboats, who immediately pushed the stricken vessel aground on underwater rocks to keep her afloat. While only a small amount of diesel was spilled as a result of the incident, approximately 2,650 gallons of helicopter fuel was also spilled. The Norwegian Coastal Administration reports that the spill has been contained and most of the petroleum has been cleaned up or has evaporated. 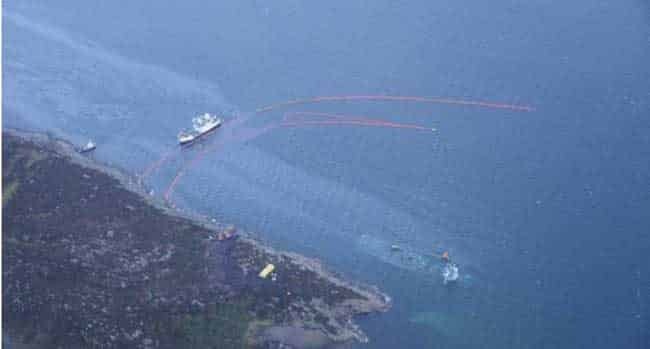 The tanker, which suffered minimal damage was carrying 625,000 barrels of crude. No oil escaped from that vessel. It was sent back into port for hull inspections. Had the tanker’s hull ruptured, the largest maritime spill disaster in that country’s history could have taken place. That accident would have far outstripped Norway’s ability to clean up the disaster with conventional mitigation equipment currently in use. The incident took a drastic turn for the worse when the Norwegian government arranged to have the 5,290-ton warship moved from its impromptu resting place to undergo repairs to its damaged hull. Utilizing wire rather than much stronger chain to tow the frigate from its place on the submerged rocks, the vessel’s weight proved too much and the wires parted. The vessel immediately began sinking in the deeper water. A full investigation by the Defence Accident Investigation Board Norway (DAIBN) and the Marine Safety Investigation Unit of Malta is currently being conducted as to the cause and details of the incident. Unanswered are questions of why the fast, highly maneuverable frigate was unable to avoid collision despite being in communication and sight of the slow moving tanker. The radar tower of the fully armed frigate is all that is visible as the vessel sits on the bottom just offshore of the port.